If you're a matchmaker and you need a fighter, no questions asked, there's one guy who always seems to answer the call. Sal Woods has fought the area's best, and that's no hyperbole. Tyron Woodley, Michael Chandler, Pat Healy are just a few of the names on his record. All in all he's faced four UFC-vets, seven from Bellator, a couple of Strikeforce No. 1 contenders, the current UFC welterweight champ, and the current Bellator lightweight champ. Needless to say, he's not afraid of a challenge. "Sal is the guy that has been in the big moments and taken the big fights even before I knew him," Woods' teammate Jordan Dowdy said. "He's fought guys that are world champions now. I used to look up at his Strikeforce banners hanging in CMMA and made it a goal to earn something similar for myself." 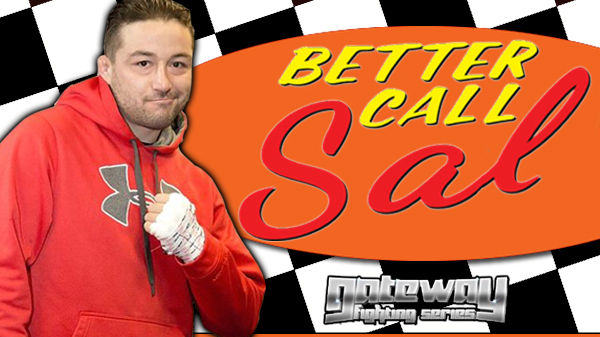 After a two-and-a-half year layoff, he's answered the call once again, this time for Gateway Fighting Series taking on Frank Sloan on Friday night. "I had some time off switching jobs for a bit." Woods said. "That delayed me getting in the gym as much as I'd like. I had a fight scheduled with Lucas (Lopes) but he got sick or something that day. Then I had a fight in Indiana but I partially tore my bicep training for that fight, so it fell through." Bad luck has kept the 32 year-old Woods out of action, but make no mistake, his desire to compete has never diminished. During the extended break, more back luck struck, Woods' home gym in Pontoon Beach closed its doors. Long-time CMMA head coach Steve Knogl left the gym to focus on his family, leaving Woods and his main training partner Jordan Dowdy without a place to train. But as one door closes, another one opens. Enter the nearby Hit Squad Training Facility. "I got lucky, real lucky that we have the Hit Squad here in Granite City," Woods said. "They opened the doors up to us and brought us in. I know some of the behind the scenes people there, and it's been great." Originally opened by Matt Hughes, Robbie Lawler, and coach Mark Fiore, the Granite City gym is one of the biggest training facilities in the area. With over 9000 square feet of training space, the state of the art gym includes over 5000 square feet of matted space, a huge workout area, and a full sized cage and ring. In 2011, Shamrock FC's Jesse Finney purchased the gym from the Hughes group, then again in 2015 the gym once again changed ownership. With new faces taking the reigns, new coaches were brought in, including 9-time UFC veteran Luigi Fioravanti. "With Luigi at the Hit Squad it's nice," Wood said. "I did a lot of coaching at CMMA, it's not the same when you're coaching. It's not always fun when you're the chief. With guys like Jordan and Sam, I want to make these guys as good as I can so they can make me better." Fioravanti's expertise and coaching has reinvigorated Woods' training. "His experience is a big factor." Wood said. "Just how tough he is, all the factors together. I was sold on the guy before I even met him, but to be working with him is great. He came from a wrestling background and went into jiu-jitsu, so his is style compliments mine. It's jiu-jiitsu but it's a grindy, wrestling style with stand-up like mine, a brawler. We have similar traits so it works out perfect for me. He's showing me stuff I've seen him do, and I know they work." New faces and new training partners at the Hit Squad have been beneficial. "I've been regimenting extra workouts at different places," Wood said. "We have the 'Friday Live' out here at the Hit Squad. Guys like Adam Cella, Joaquin Buckley, Aaron Highfill, a bunch of local pros. It's great because I'm getting a bunch of different looks, and this helps with your confidence. It's nice to get new training partners, but we have a saying 'we always break our toys', so it always ends up being me and Jordan." Woods and Dowdy have been nearly inseparable since Dowdy joined the team in the fall of 2010. "We're kind of an odd couple, we feed off each other," Wood said. "I feel like I'm more of a brute, cavemen style and he's more of a finesse guy, it works great. It shows in our style of fighting, I'm more gritty, and he's more methodical. He's constantly grinding, he's got a great work ethic that captures the whole aspect of MMA. He's a complete martial artist, the way he lives his life, eating clean. Knowing I have that in my back pocket is a big advantage." Dowdy, also an established pro, credits much of his success to Woods. "He has been mentor, coach, the "big brother" deliverer of beatings and humble pie, but most important, he's been a real friend to me." Dowdy said. "I wouldn't be the martial artist I am today without the guy, that's for sure. I watch how he worked and drilled and made it a point to emulate that work ethic and learn as much as I could." Recently the pair have been seen wearing the traditional jiu-jitsu gi for the first time in their careers. "In addition to the training at the Hit Squad, Jordan and I both took up true Brazilian jiu-jitsu." Woods said. "We're both white belt, 'no stripers'. We've been training at the Mckinney Headnod HQ in Pontoon. That's like three minutes walking from my house, so that works out well. I've been friends with Adam Marburger for a wile, he had me on shows back in the day. Last summer we had some good rounds with McKinney, I went with him again this winter and he tapped me two or three times in a few minutes, it wasn't event close. I thought this is where I need to be, I've got to train with these guys so I can get better." Tightening up his ground game, Woods feels stronger than ever. "I've always felt well-rounded, and now I even feel better," Wood said. "I'm not going out there for a takedown or to knock him out, I just going out there to feel out where the fight goes. I know my skillset and I know I feel great in almost all positions. The plan is just go out there and have fun, it's what it's all about." Woods' opponent on Friday, Frank Sloan, also recently changed gyms, showing up on the mats at St. Charles MMA. "I've watched a few of his fights so I have an idea of how he fights." Wood said. "He looks like a guy who has power in hands, similar kind of background as mine. It's always nice to know you can throw your hands especially when you know you have wrestling behind it." Woods and Sloan are the third pro fight on the main card. "Fan can expect non-stop action no matter where its at," Wood said. "Frank seems like the same kind of guy as me. Take your bathroom break before because it's going to be a barn burner."